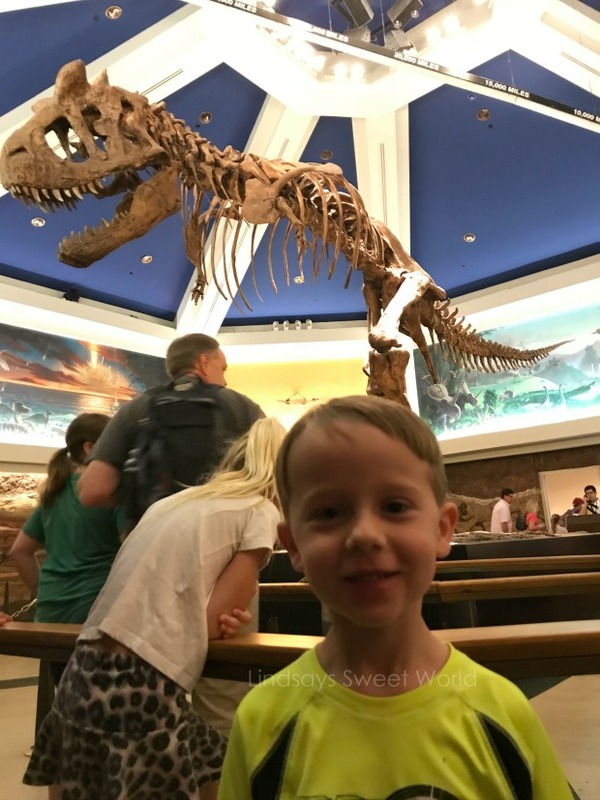 Sunday was our first day in the parks and our travel agent had us booked for Animal Kingdom. Animal Kingdom opens at 9 AM, but if you stay at a Disney Resort you can arrive one hour early to have access to the parks before everyone else does, therefore, we wanted to be in the park by 8 AM. Our travel agent had told us to try to leave our resort around one hour prior to the parks opening each day, so we took her advice and did just that! Since we could be in the park by 8 AM, we were up bright and early at 6 AM to get ready and then we left our resort room a little after 7 AM for the short walk to the bus stop. We only had to wait a couple of minutes for the Animal Kingdom bus to arrive and then it was around a 15 minute bus ride to the park. Disney is extremely thorough when it comes to security so they check every single nook and cranny of every single bag and stroller. I was worried security would take a long time, but we were in and out in just a few minutes. We had no breakfasts planned (except for our character breakfast on our last day) and we knew we wanted to save our quick service meals for lunches, so each day we just carried granola bars and fruit pouches to the parks for the kids and Larabars for B and me. We also brought our Disney cups to the parks each day and kept them filled with water all day so everyone could stay hydrated. While we were in line for security, everyone just ate their bars and sipped their water and by the time we were done eating, we were through security. We did this every single morning and it worked perfectly! And that way we didn’t have to waste time eating breakfast in the room! After we made it through security it was time to scan our magic bands and enter the parks! Our travel agent had set our three fast passes for the day for three of the most popular rides and our first one didn’t start until late morning, so that gave us a chance to run to all of the rides that we wanted to ride that we didn’t have fast passes for to get there before the lines got long! First up on our list was Na’vi River Journey in The World of Avatar. We only had to wait about five or ten minutes and then we were in! The ride was on water but it was slow and we all enjoyed it. It wasn’t scary or anything like that so it was a good way to ease the kids into their first Disney ride. Since Na’vi River Journey was close to the entrance, we looped back around by the Tree of Life and stopped to have a Disney photographer snap a few pictures of us. And you guys, I don’t know what that tree is really made out of, but it is GORGEOUS! It is HUGE and it looks so real! The main ride that Brian wanted to do in Animal Kingdom was Expedition Everest and we knew that the wait times would get really long once the park was open to everyone, so we started heading that way. We just so happened to pass the building to meet Mickey and Minnie on the way and the line was short, so we went ahead and stopped there. We had to wait probably 15ish minutes which wasn’t terrible considering the wait later in the day was 45 minutes to an hour! YEESH! The kids loved meeting all of the characters even though it doesn’t show in a lot of the pictures. Both of them tended to do these weird fake smiles for all of the pictures, but I promise they had fun! They got their first autographs in their books, posed for some pictures, and then we were on our merry way toward Expedition Everest again! Neither of the kids were tall enough to ride it since it’s a major roller coaster, so B went alone. He was able to do the single rider line and he only had to wait about ten minutes, so the kids and I hung out by the main drop of the roller coaster and we got to see him come down. He said that he loved it! We knew there were several kid rides in Dinosaur Land so we started walking in that direction next. We got sidetracked by all of the monkeys on the way because they were out and very active, and then we saw a sign to meet Pocahontas so we stopped there, too. We probably waited about 15ish minutes to meet her as well and she spent a few minutes with the kids. Y’all, these Disney cast members really take their jobs seriously and they never break character. I swear sometimes I forgot that these were just regular people acting like fictional characters. Haha. Once Pocahontas had signed their books and chatted with them for a bit, we continued in the direction of Dinosaur Land and we got there just in time to ride the TriceraTop Spin with only about a 5-10 minute wait. That one is a kiddie ride for everyone, but Olivia didn’t like the sound that the hydraulics made when the ride went up and down (she hates loud noises) so she almost didn’t go on it. We finally convinced her to go but she kept her ears covered the entire time. Bless. We played several different carnival games, but there was one in particular that Olivia loved – probably because she was so dang good at it! – and we ended up playing that one three times! It was a huge table filled with cups and only a few of the cups had colors on them. If you throw the ball in one of the colored cups then you win a prize shown for that color. Well, on her first game, Olivia rung one of the cups to win a medium prize and on her second game she rung two of the cups for the small prizes. The people around us were amazed because nobody else won anything and Olivia won three! Haha. On her third game her luck had finally run out and she won nothing. For her medium prize she opted to get a blue sea serpent, and then for her second prizes they gave her the option of getting either two small prizes or one medium, and she chose to get one medium so she could give a twinning sea serpent to Jacob. So sweet! By that time the boys were back from riding Dinosaur and B reported that Jacob hadn’t liked it too much. He said that it scared him, but he recovered quickly and we let him play a few carnival games with the tickets that remained. He tried his luck at the cups game, but just didn’t have the same luck that Olivia had. By that time we were all a little tired and getting a bit hungry, so we headed back to The World of Avatar to go eat lunch at Satu’li Canteen. Our travel agent had recommended it since it was close to our first Fast Pass ride and since she hadn’t steered us wrong yet, we decided to give it a whirl! I ended up getting the Slow-Roasted Sliced Grilled Beef Bowl that was topped with vegetable slaw, boba balls, and a whole bunch of other stuff that was not identifiable, and y’all, it was probably one of the best salads I’ve ever eaten in my entire life. It was SO. GOOD. Also, since the quick service meals now include alcohol, B and I both indulged in an ice cold beer to cool off. I opted for the organic blonde ale and it was delicious. And another tip – with your quick service meals, not only is alcohol included, but you can get the 16 oz. OR the 22 oz.! I couldn’t believe it! And yes, we both went with the 22. Haha. While we were there the kid next to us sat down with cupcakes so naturally our kids wanted cupcakes, too, so B headed back to the line to see about using some of our snack credits for the cupcakes. Well, apparently they only give those to people who are celebrating birthdays, but since they knew our kids wanted them, they just went ahead and gave B two of them anyway. For free. DISNEY, Y’ALL!!!! At this point the kids were looking a bit sleepy, so I decided to camp out at the restaurant with them for a bit so they could rest and stay cool while B headed over to use the first of our fast passes for the day. The first fast pass was for Avatar Flight of Passage and both of our kids were on the brink of not being tall enough (plus we had read that it’s a bit intense) so Brian went to ride with one fast pass first so he could judge whether or not we needed to take the kids. Once we got word from him that he was almost on the ride, the kids and I got up, took a potty break, and then walked out to meet him as he exited. As they exited Brian was just shaking his head and he reported that Jacob was TERRIFIED and wanted to get off almost immediately after it had started. Bless his heart. He seemed fine and was pretty much already over it by the time they got off, though! We still had one fast pass left on a bracelet so B told me that he would watch the kids so I could go, but y’all, the older I get, the less I enjoy a thrill ride, so I decided not to and we just let that last fast pass go to waste. We ended up going on a ride in Hollywood Studios a few days later that made me feel sick and claustrophobic, and B later told me that the Avatar ride had been like that but way more intense, so I definitely made the right decision! Ha! Our next fast pass was for Kilimanjaro Safaris, but we had some time to kill before it started, so we headed over to observe the hippos and the gorillas. I think I could have stayed there all day and watched those gorillas. They were so funny. When we went there was a momma gorilla and two babies and the babies kept running over to this bucket that was out there and flipping it over and sitting in it and it was the cutest thing ever. There were also a few full-grown male gorillas that were just HUGE… they were just so neat to see in person. Once our fast pass window opened, we headed straight to Kilimanjaro Safaris and settled in for our “ride through Africa.” This was probably the longest ride we took… I want to say that it probably lasted about 20 minutes and it did not disappoint. We saw rhinos, hippos, crocodiles, cheetahs, giraffes, hyenas, wildebeests, warthogs, elephants, flamingos, ostriches, and lions… they were all very active and most of them were up close and personal! It was a little unnerving knowing that one of them could have just walked up to our trolley at any point. Geesh! Right at the end of the safari, we passed by a rhino that just so happened to start peeing right when we were next to it, and the kids thought it was just the funniest, best thing ever! To this day, any time anybody asks them what their favorite thing was about Disney World they always say, “The rhinoceros tee-teeing.” Or if you’re Olivia she says, “The Nie-Noceros tee-teeing.” Lol. Of all of the things to love at Disney World! Can’t make this stuff up! Everyone was pretty hungry at this point, so we found an ice cream stand, grabbed some trusty rusty Mickey ice cream bars for the kids and a chocolate covered banana for me, and we took a little rest break. We found some shade, plopped the kids in the double stroller we had borrowed from one of my friends (GODSEND), and then relaxed for a bit. Some of us became a little too relaxed and decided to conk straight out in the stroller. Bless. Our final fast pass of the day was for Festival of the Lion King at 5 PM, so we headed on over there next. Olivia stayed asleep the whole time while we waited in line and filled up the theater and then she woke up just in time for the show to start. The show lasted about 30 minutes which gave us a chance to cool off and sit for a while and it was just phenomenal, y’all! There were fire jugglers and acrobats and trampoline jumpers and all kinds of amazing things to see during the show. Our whole family loved every single second of it! We had 5:30 dinner reservations at Tusker House, so we went straight over there after the show was over for our very first character dining experience. Tusker House is a buffet-style restaurant and goodness gracious they had loads and loads of foods from every country to choose from! We all loaded up our plates, the waiter brought our drinks – WINE! WOOP! And I should probably mention that we let Olivia have chocolate milk for the very first time, also. 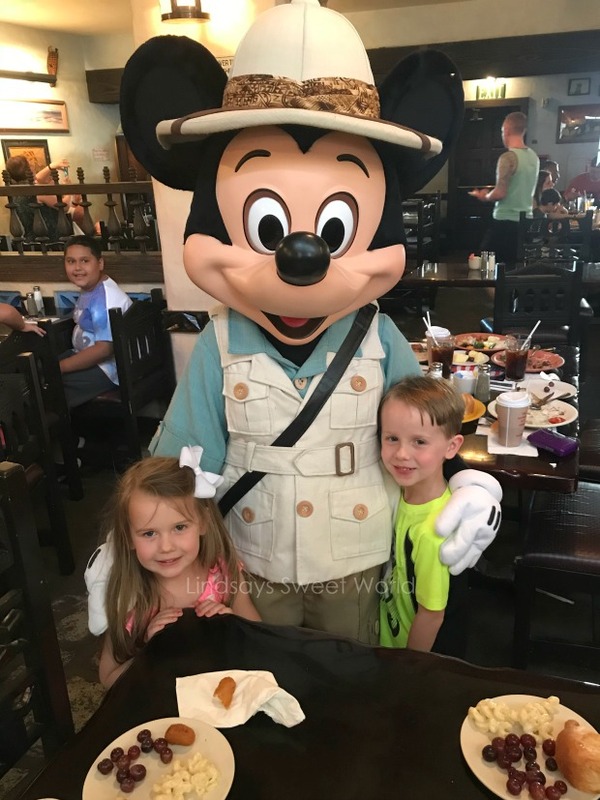 ;o) – and had barely gotten settled in when Mickey stopped by our table. I actually missed it since I was at the buffet, but fortunately we had already met him earlier in the day so I wasn’t too upset. We also met Donald Duck, Daisy Duck, and Goofy throughout the rest of the meal and they really thought it was cool that they just came to our table! They could hardly concentrate on their food! Once all of the characters had come around we went back to the dessert buffet and grabbed almost one of everything. Lol. This strawberry shortcake with these little beads on it was my favorite. And can somebody PLEASE tell me what these little beads are?! Disney had them on almost all of their desserts in all of the parks and they are like delectable little pieces of heaven! I NEED THEM AT HOME! The kids played in some fountains for a bit after that, and then we headed back to the bus stop to head to the resort because it was already 7:30 PM! It was SUCH a wonderful first full day at the parks! Whew, I'm exhausted just reading this! And this might have been the world’s longest blog post ever! Just wait until Magic Kingdom Day… EEK! And if you missed it, my post on about our first day at Disney Springs is here! Still to come - Epcot, Magic Kingdom, Hollywood Studios, and a character breakfast at Ohana! Bye, y’all! I went to Disney for band one year and absolutely LOVED the safari at Animal Kingdom. Definitely a do not miss experience! This looks like so much fun! I can't get over how beautiful it is there! Wow!! Did you find using a travel agent helpful? I like Animal Kingdom for the animals and how pretty it is! I'm not sure if we're going there this time though. If we do, I know Zachary wants to go on Everest and we'd all want to do the safari and Festival of the Lion King - that show is awesome! It looks like you had a blast! All the Avatar things are new since we were there last March. Don't you love the Disney Photopass? It was a splurge for us, but made it so fun to all get in the picture! Wow. I love how informative your posts are. So much detail which is great for anyone wanting to go. Sounds like a great first day in the parks! Look at all of those smiles!! So fun. Random question - did having a travel agent make things a ton easier? We always book everything ourselves and I always get so overwhelmed! OMG GIRL, YES!! If you ever go do yourself a favor and use the travel agent!! I can give you our contact info for our girl if you want... she was fantastic! I swear, I barely did anything for our trip and I have a feeling if I had tried to do everything myself I would have messed something up. Using the travel agents is wise because they can often do things for you that you wouldn't even know you could do for yourself. Plus, they're free so why not?? You're making me want to hop a flight to Disney RIGHT NOW! What a fun adventure! I love the pic of B on the roller coaster by himself! Sorry y'all all couldn'y ride it! That salad looks so good! I can't wait for the Magic Kingdom recap! What a fun day :). You got to see and do so much and yay for maximizing the rides with minimal wait times :)! Wow look like you guys really had a great time in Animal Kingdom! What a great tip about doing breakfast in line! Mount Everest is my favorite ride in the park! Also, Dinosaur is a super scary ride so I don't blame him for getting a bit scared! ;) When my husband and I wear at the carnival games we saw Goofy and Pluto playing the games, which was so fun! Disney really does have the best customer service! I'm a little scared of roller coasters the older I get so I wasn't too disappointed that I didn't get to ride it, but part of me kind of wants to try it next time we're there! Oh, we actually saw Goofy and Pluto at the carnival, too! They were cutting up and being so silly! We can not wait to try out the new Avatar area and the rides! 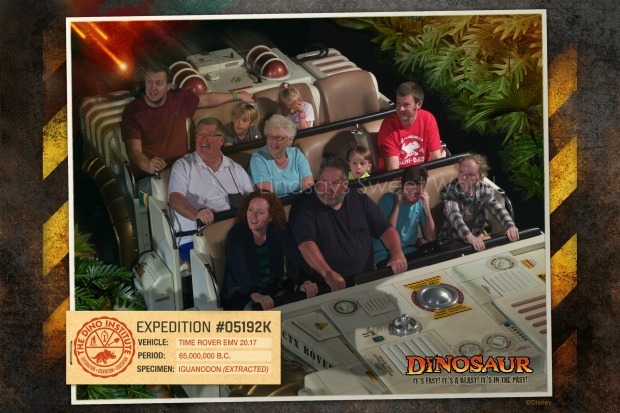 I found Dinosaur to be intense myself with not only the dinosaurs but the jerkiness of the ride. I do LOVE Everest though. I always hated trill rides as a kid but find I am loving them now as an adult. My husband and I went to Disney a few years ago by ourselves and rode everything we had not been able to ride with the kids (now they're big enough to ride it all). My husband said the same thing about Dinosaur being jerky. And how fun for you and your hubs to go to Disney alone together! That would be so much fun!